Being 30 kilometers far away from the mainland, Ly Son Island (đảo Lý Sơn) is the only island district of Quang Ngai Province (Tỉnh Quảng Ngãi). Formed from the volcanic eruption millions of years ago, Ly Son owns a unique natural landscape that captivates all tourists. 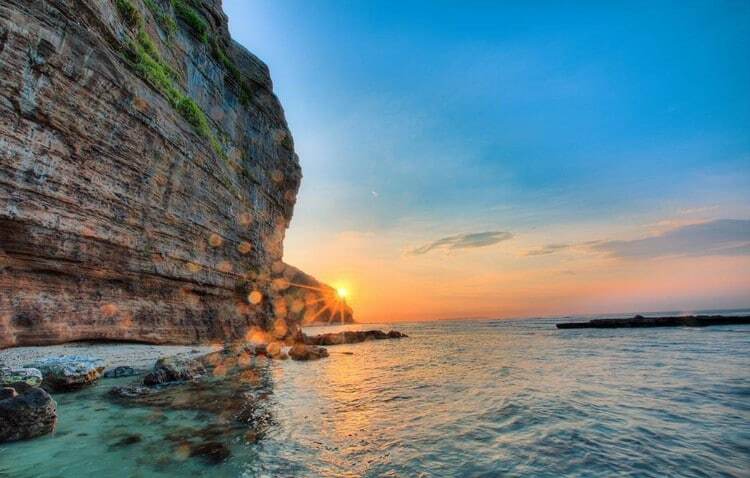 This island is likened to “heaven island” or “Jeju Island of Vietnam,” and thus, it will certainly give you an unforgettable journey. The most beautiful time to visit Ly Son is from June to September because the weather is quite nice and sunny, suitable for swimming. I. How To Get To Ly Son? To get to Ly Son from Ha Noi (Hà Nội) or Ho Chi Minh City (Thành phố Hồ Chí Minh), you both first have to be in Quang Ngai, and the best way is to fly from Noi Bai (Sân bay Nội Bài) or Tan Son Nhat Airport (Sân bay Tân Sơn Nhất) to Chu Lai Airport (Sân bay Chu Lai). After landing off, you can choose to taxi straight to Sa Ky Port (Cảng Sa Kỳ) or catch a bus from the airport to Quang Ngai Station (Bến xe Quảng Ngãi), then switch to Sa Ky Port’s coach. The distance from the airport to the port is around 50 kilometers, which will take you from 45 to 60 minutes to reach your destination. At the port, find Sa Ky Station (Nhà ga Sa Kỳ), buy a speedboat ticket to go to the island, and spend 1 hour on the boat. Usually, there are two trips from Sa Ky Port to Ly Son Island every day, at 8:00 in the morning and 2:45 in the afternoon. On public holidays, the number of the trips will rise up to nine. In the case you are on a budget, going by train or coach instead of flight is a reasonable option. II. What Are Attractions In Ly Son? With clear sea water, vast white sand, lush green coconut trees, and eye-catching coral reefs, beaches in Ly Son will amaze you and make you want to indulge in. From the main island, you can book a canoe ticket to Be Island (Đảo Bé) at Ly Son Port (Cảng Lý Sơn). The area of this island is pretty small, perhaps that is why it is named as “Be,” which mean “small” in English. On Be Island, you will be able to have a tour around the island by tram, visit the village with unique mural paintings, and finally stop at the beach. You can swim right there, or hire a coracle out to diving sites and admire colorful coral reefs. Being an island with the area of nearly 10 square kilometers, tourist spots in Ly Son are not too much, and Thoi Loi Mountain (Núi Thới Lới) is one of the must-experiences. You have to once climb up the mountain to contemplate the whole scene of Ly Son from above. Especially, the sunrise scene when viewed from the top of the mountain is extremely magnificent that you really should not overlook. Besides, you will find the National Flagpole (Cột cờ Tổ Quốc) standing on the mountain peak with a height of 20 meters looking over Hoang Sa Archipelago (Quần đảo Hoàng Sa), as well as a freshwater lake, which was formerly a volcanic crater. At the foot of Thoi Loi Mountain is Cau Cave (Hang Câu). In the midst of majestic natural scenery with mountains on the one side and the sea on the other, Cau Cave appears as a giant sculpture. It will be a huge omission if you do not visit the field of garlic while exploring Ly Son. Garlic is also the famous specialty of this island. It is grown in September and harvested in early December, therefore, in the tourist season, you can buy dried one as a gift for family and friends. The field is a favorite shooting location for lots of visitors. To Vo Gate (Cổng Tò Vò) is another popular landmark on Ly Son Island, where anyone who comes here must visit once. The gate is 2.5 meters high and considered the most picturesque arch of Vietnam. What makes this place so attractive to tourists is that it is entirely pristine and has no artificial trails. Standing on To Vo Gate looking toward the south, you can see the fishing village of the fishermen on the island, meanwhile in the north is the grand scenery of Gieng Tien Mountain (Núi Giếng Tiên) – an extinct volcano. Watching sunrise and sunset at To Vo Gate is the same wonderful experience like that at Thoi Loi Mountain. Some more spots that are worth mentioning including Hang Pagoda (Chùa Hang), Duc Pagoda (Chùa Đục), An Hai Communal house (Đình làng An Hải), the old and new lighthouse (ngọn hải đăng cũ và mới), Hoang Sa Bac Hai Museum (Nhà trưng bày Hoàng Sa Bắc Hải), and Mu Cu Island (Hòn Mù Cu). 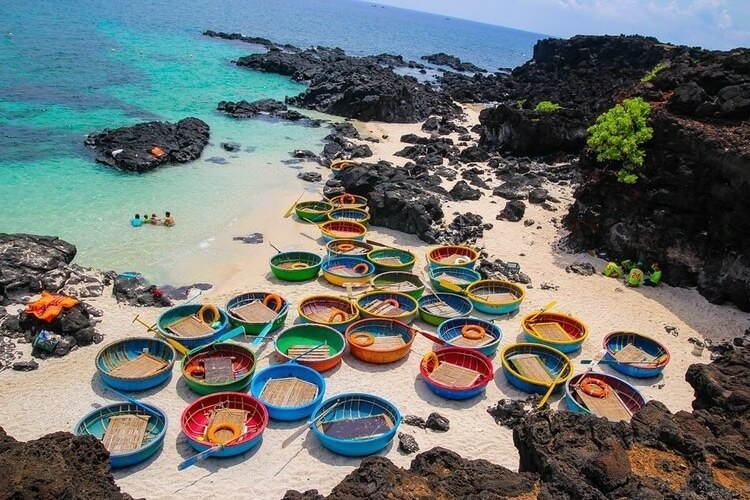 While islands in the area such as Binh Ba Island (Đảo Bình Ba) or Binh Hung Island (Đảo Bình Hưng), as military islands, do not allow foreigners to tour, Ly Son Island always welcomes people from other countries. Hence, you are free to invite your foreign friends to participate in the discovery of Ly Son. III. Where To Stay In Ly Son? Recently, due to being a tourist attraction engaging more and more visitors along with the extension of the national electricity line, Ly Son has been investing heavily in accommodation services. Near Ly Son Port there are various fully equipped hostels and homestays with very affordable prices, only 300.000VND/room for two in 1 night. 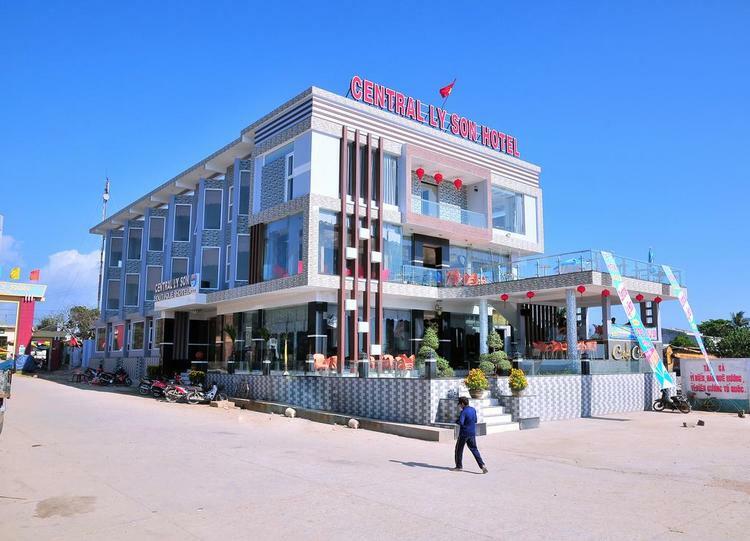 If you are in leisure travel, you can stay at Central Ly Son Hotel, which is the largest and most modern hotel on the island. The price there is slightly higher, but you will have breakfast offers. IV. What To Eat In Ly Son? Seaweed salad (Gỏi rong biển): Anyone ever enjoys cannot forget the rich taste of seaweed salad. Green round fresh seaweed mixed with basil leaves, topped with chopped peanuts and fried onion, then poured sour and spicy dressing over forms a simple but delicious appetizer. Garlic salad (Gỏi tỏi): As garlic is a specialty of Ly Son, garlic salad is really one of a kind. The peculiar feature of this dish is that local people use the body instead of the garlic bulb for processing. After peeling the outermost skin, the stems are washed and steamed, then mixed with spices and topped with peanuts. Talkobo (Ốc tai tượng): Talkobo is the most popular seafood in Ly Son. It is not easy to catch talkobo because this shellfish exists in very few seas. The meat of talkobo has a similar texture to squid, which is crispy and tough at the same time making diners surprised. Diverse dishes can be made from talkobo, for example, raw talkobo with lemon juice and wasabi, steamed talkobo with garlic and chili, stir-fried talkobo with butter, and talkobo porridge. Conch (Ốc xà cừ): Ly Son’s conch is considered to be better than other seas’ as it is super sweet and crunchy. Typical conch cooking methods in Ly Son are roasted, boiled, and stir-fried with lemongrass and chili. These methods will help retain the original flavor of the conch and also elevate this rustic seafood. Spanner crab (Cua huỳnh đế): In history, spanner crab was the tribute to the King because its meat is soft and moist, roe is dense and fatty, and nutritional contents are higher than all other types of crabs. This is a dish that you cannot ignore during your trip to Ly Son. The name “Ly Son” has never been old-fashioned and is always on the list of worth-coming places of the youth. Now you are keeping in your pocket the valuable experience to have a great expenditure at Ly Son, do not hesitate to set up a travel plan with your friends or family in this adorable island. To get more info about Vietnamese tourism, visit our Vina homepage.